Opening their latest store on Sydney Road, Dresden does things differently. They are the designers and manufacturers of their own modular glasses frame system. It’s like Lego for glasses! At Dresden you’re buying straight from the manufacturer – one who cares about community and their impact on the environment. 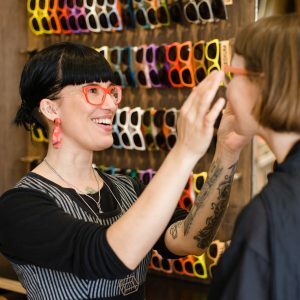 They make their frames in Australia using recyclable materials in a zero waste, closed loop. They’re also experimenting with upcycling plastic rubbish & ghost nets washed up on Australian beaches and beer keg lids to create their frames!